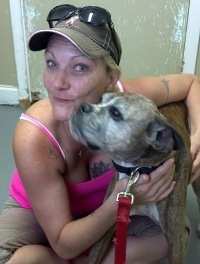 A few years ago we were asked to take a boxer who needed some special love, we did not hesitate we jumped in with both feet, unbeknownst to us we would be getting the special love. From day one Jersey made it known that she was not visiting but here to stay. On Jersey’s third day in our home she decided to jump in as well, quite literally into the shower with my daughter, after the shrieking and the MOM comments died down we all had a good laugh. Jersey loved to hide under blankets and watch you walk by it became our game where is Jersey? She was a sweet, sweet little girl who resembled a gremlim especially when she was up to something. I do not believe that this special little grumpy old lady ever knew that she was old, the only times she was really grumpy was when she was in pain, however her wiggles and grins when she saw any of her family never stopped. My daughter her “shower victim” formed a special bond with Jersey and will be impacted by the unconditional love this special little gremlim gave her. No matter the hardships Jersey experienced in her life prior to us she never missed an opportunity to hug and kiss us, a little cuddle or a flat out rub me. Jersey will be missed tremendously she will forever leave a hole. We could not be more grateful for the time we had with our girl. We volunteered to help Jersey, we never knew how much we would learn from her. RIP baby girl.